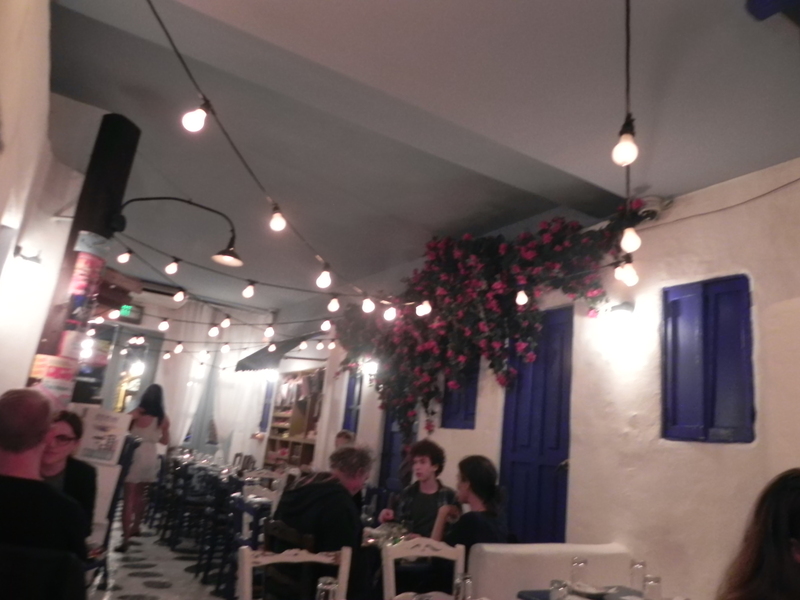 This nicely decorated place was very intriguing to me (Pinky) — I was won over by their whole Greek-inspired decor, at first sight. On the side once you enter, they have the latest magazines hung on a wire, as well as some snacks from Greece (I am assuming). OKAY, an important note: BEWARE when you sit down at a small circular table. Victor almost destroyed the restaurant because the tables are so badly designed. The legs of the table STICK out, so when you put your own legs under the table, you will most likely hit it and therefore attempt to turn the table (and glassware) on its side…Seriously, be careful — it happened three other times to other people and that all during our visit. A gyro (/ˈjɪəroʊ/yeer-oh,/ˈʒɪəroʊ/zheer-oh;Greek: γύρος, [ˈʝiros], lit. ‘turn’) is a Greek dish of meat roasted on a vertical spit. It is commonly served in a sandwich with tomato, onion, and tzatziki sauce, wrapped in pita or sandwich bread. 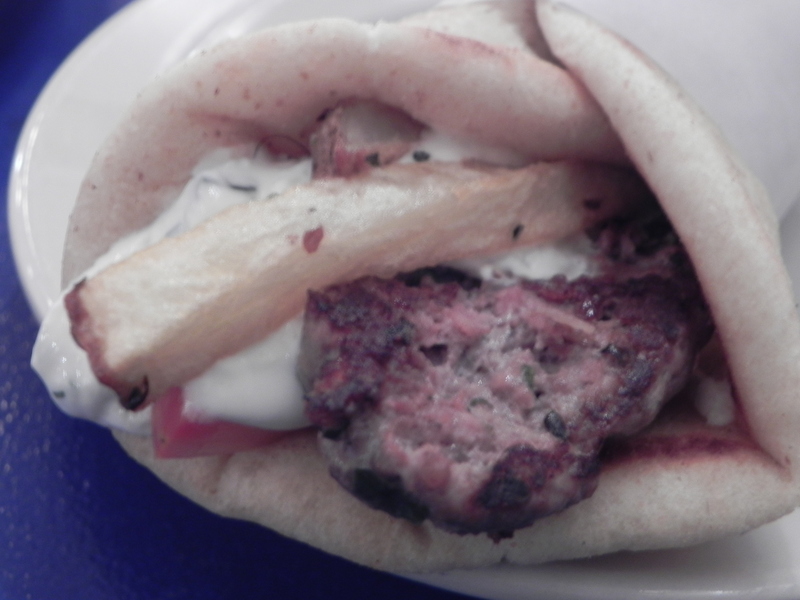 I also learned from Wikipedia and Souvlaki GR that sometimes they add fries to your gyro…strange! Save your money and go else where. 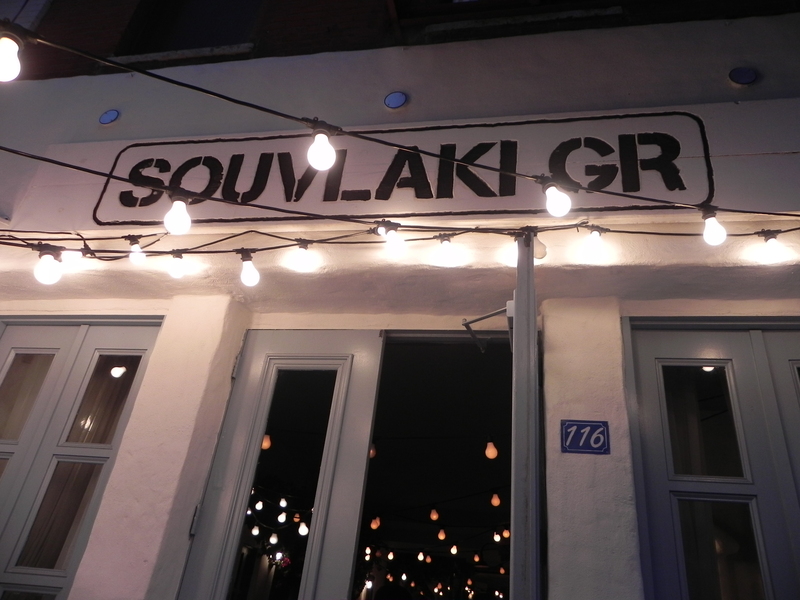 Souvlaki GR isn’t that good and you can definitely find better Greek food around. 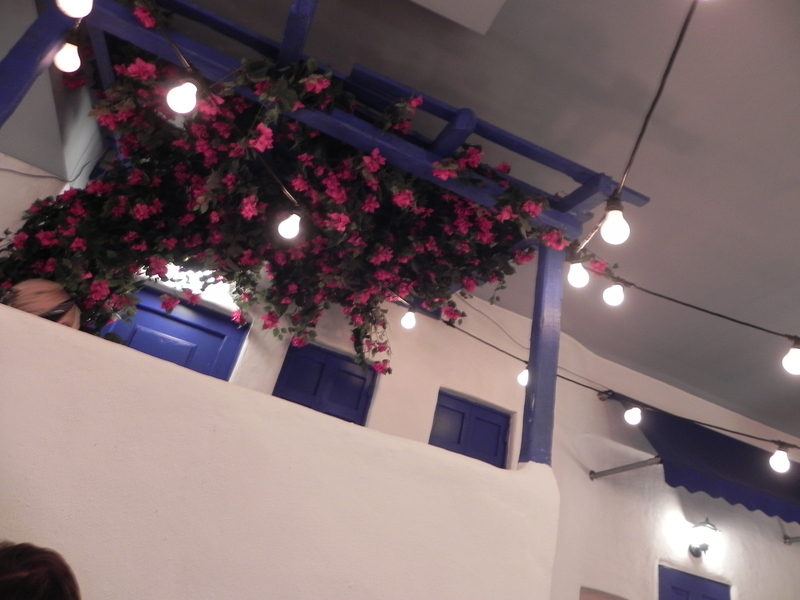 This place can be a tourist trap with the bright lights and nicely painted walls, but don’t fall for it! It’s quite expensive for the portion you get and it just tastes… okay. By first impressions, this place looks sorta nice. They got these dangling lightbulbs in front their restaurant. We also saw their food truck across the street. The decor inside was nicely painted. 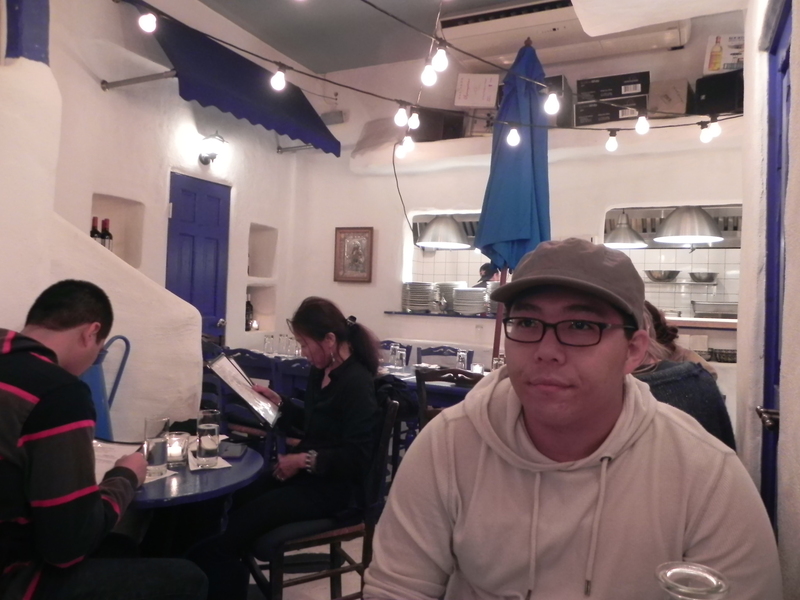 It had a very Mediterranean feel with the white and blue colors with fake doors and windows. There’s also one table that’s elevated from everyone else. Honestly, I think that’s just silly because the stairs take up space to get to that one table. The restaurant itself is not very spacious either as noted from my close call of destroying the tableware. Time to talk food. First off, it’s expensive for something that’s not very spectacular. We ordered a chicken and pork skewer. The chicken tasted a bit raw. It wasn’t seasoned very well and it just didn’t appeal to me. The pork one tasted a little better and had more seasoning. 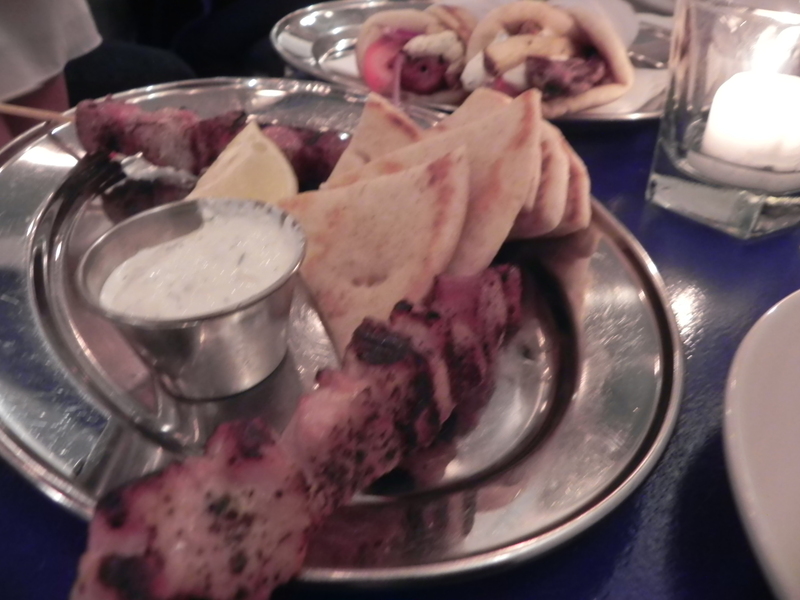 It also came with a cup of tzatziki sauce with slices of pita bread. Majority of the time, I found myself spreading the tzatziki sauce to make it taste better. 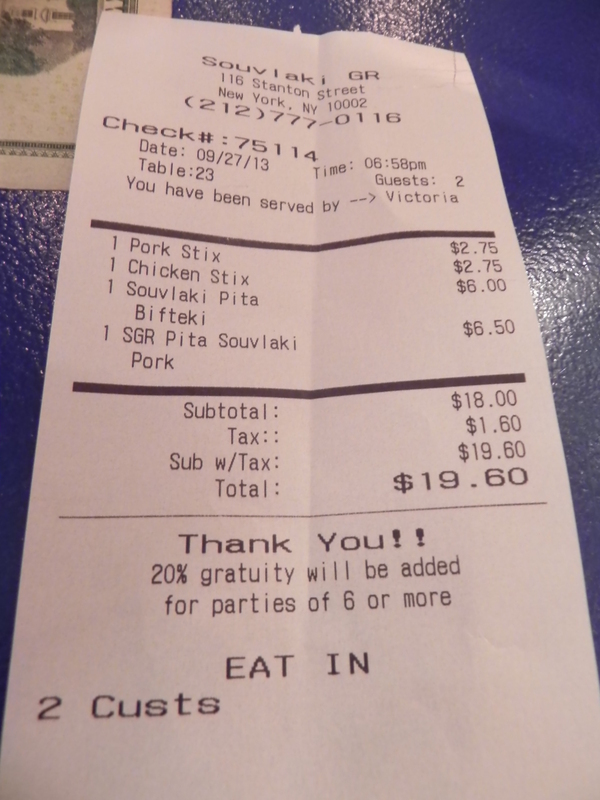 The SGR Pita Souvlaki I ordered was basically a pork skewer gyro. It’s the same amount of meat as the skewer wrapped with two french fries, tomatoes, red onions, Tyrokafteri (spicy feta dip) in a pita. It’s such a small portion and I feel like you can get more for your buck at other places. 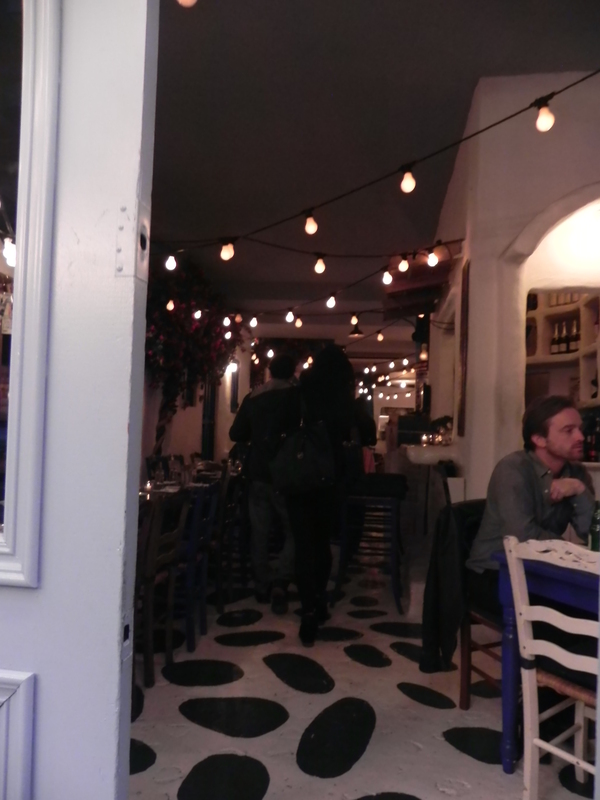 Maybe I’ve been spoiled by other Greek restaurants, but this place didn’t live up to it’s hype. Probably won’t be coming here any time in the near future. Okay here goes..scroll back up to that picture above for a minute. Carefully inspect the picture..and come back after. There is a piece of hair nicely tucked into the warm pita bread near the top-left side of it. Delicious, right? No, that was not listed on the menu as an ingredient. I was so appalled by the little new friend peering at me. Thank you Jesus, that I did not bite it on that side, but bit the right side. I did not even notice it at first, while I was taking the picture. By the way, we apologize for the blurry dark pictures — bad lighting in there. However, what…kind…of… hair, do you ask? Beard hair. Not even head hair, which I don’t think I would mind as much? I’m not sure, what do you all think? What’s worse: Beard or head hair in your food? I have to say that the manager was alright with my complaint and gave me a new gyro, but they probably did spit in my food. Hahaha. I should have actually cancelled the order because it wasn’t even worth the $6. I thought it would taste completely amazing, but it was just normal gyro that I can get from a food cart, and possibly those food cart ones would be bigger and more filling. The only special thing was that it had massive amounts of feta cheese. BLEGH, which only made it extremely salty. I only asked for it to be re-made because we were already so hungry. While eating it, I kept imagining that I had a hairball stuck in my throat. I’m not even sure why we waited longer compared to the other people around us, despite the fact that we sat down first. On the topic of seating, I was sitting right next to an ACTIVE doorway, with the employees coming in and out. During the whole night I was scared to move an inch because it can result in total chaos. I could not move my arms or I can hit a waiter holding food and could not move my legs or I can flip the table and all of its contents over. For me, I get stressed easily in social situations, so you can already tell I was not having a grand ol’ time. Being that I watched the documentary film, Objectified, there is seriously no reason for a chair to be uncomfortable…and there should definitely be no reason why a table should be unstable. I understand those tables are cute, but if I am eating a legit meal and not having a tea or coffee break, I would like to have my table to hold more than three small plates. It was pretty hilarious to knock the table over then see others do the same though. And being the silly girl that I am, I was not aware that there can be fries put inside a gyro. When it said “fries” on the menu, I thought it would be on the side, and being the big potato girl I am, I was so excited. Then I fell into deep depression, as I only saw two fries sticking out of it. The more entertaining fact was that since both of Vic’s and my gyro were plated on one plate, I thought both of them were one order. The skewers were also nothing special — I can’t believe they were $2.25 each. I can grill them myself, thank you very much — there was no real flavor to it. 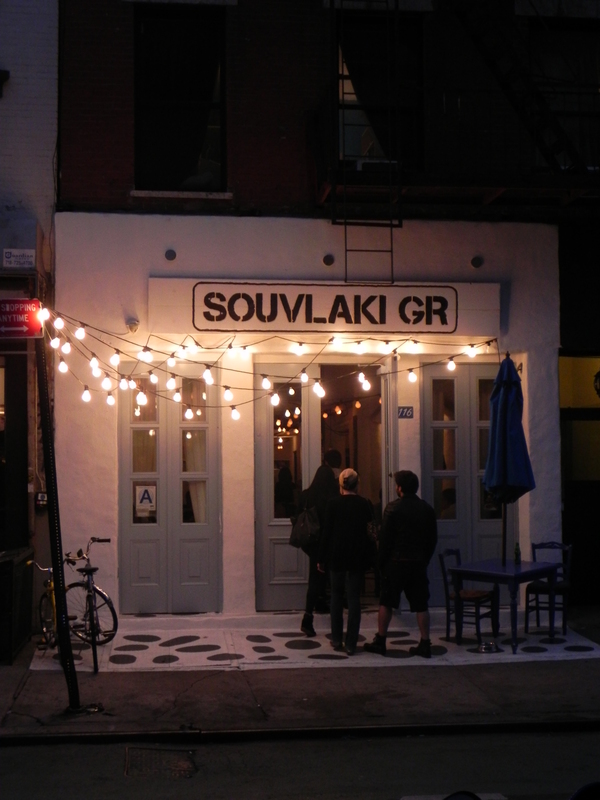 Posted on September 30, 2013 October 2, 2013 by pinkytwinkieeePosted in manhattan, New YorkTagged beard, beer, burger, cramped, dinner, drinks, eating out, feta, food, fries, greece, greek, gyro, hair, LES, lunch, New York, nightmare, no, oh no, omg, pita, restaurant, review, sandwiches, sauce, shock, skewers, small, tomato, weird, why, why me, wow. Previous Previous post: Kimganae Korean Restaurant – Korean Sushi!?! ?